new systems or server modifications. Simple data virtualization. Real-time decisions and reporting immediately. Data virtualization does not have be hard and costly! Do you have too many databases to manage? Is your data in multiple places? 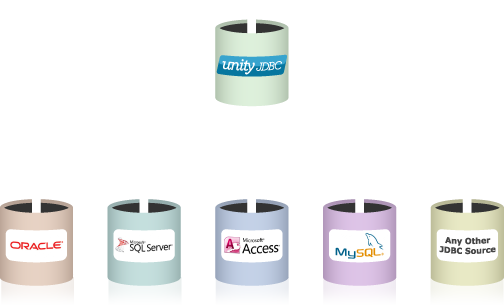 Query and synchronize multiple databases including Oracle, MySQL, PostgreSQL, and Microsoft SQL Server with the free UnityJDBC multiple source plugin for open source SQuirreL SQL. 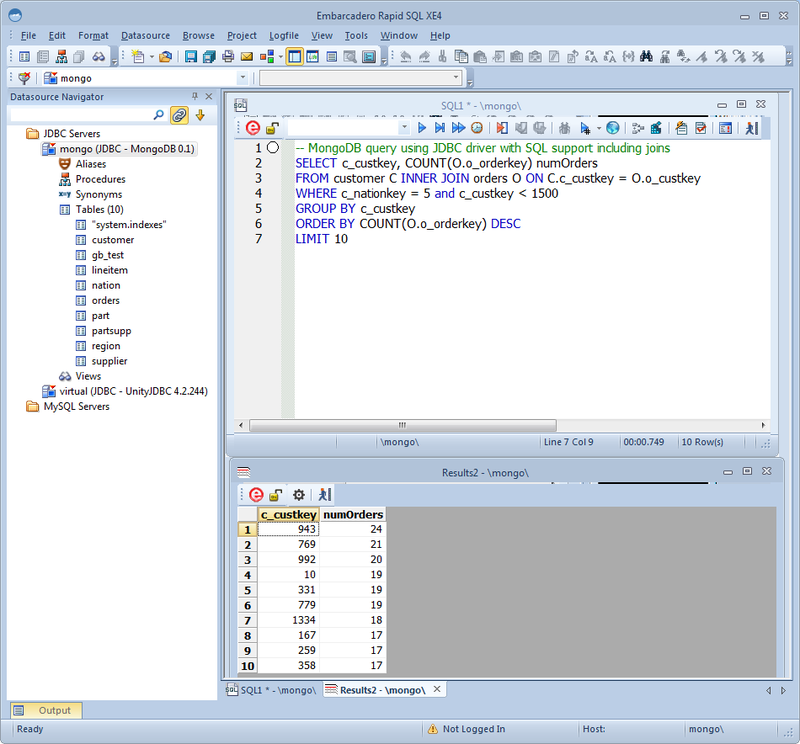 The JDBC driver for MongoDB allows SQL queries on MongoDB and integration with JDBC-enabled tools. Combined with UnityJDBC virtualization, joins between MongoDB collections and relational databases like MySQL are easy. Are you making business decisions with all your valuable data? Perform business intelligence and reporting with all your corporate data wherever it is! UnityJDBC integrated into any reporting solution, including open source JasperReports, transforms data into intelligence to increase sales and profits. JDBC Driver for MongoDB® - The JDBC driver for MongoDB allows SQL queries on MongoDB and integration with JDBC-enabled tools. Combined with UnityJDBC virtualization, joins between MongoDB collections and relational databases like MySQL are easy. JDBC Driver for ServiceNow - The JDBC driver for ServiceNow allows SQL queries on ServiceNow and integration with relatonal database systems and reporting software. JDBC Driver for Splunk - The JDBC driver for Splunk makes the power of Splunk accessible to your enterprise reporting infrastructure with standard SQL and JDBC support. 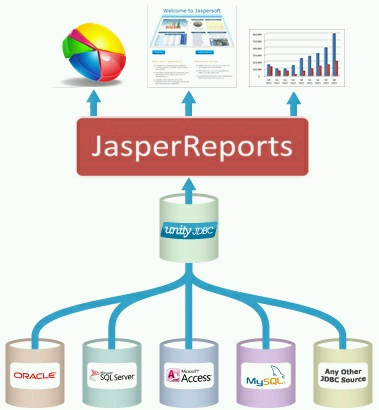 Multiple database reporting - allow your reporting software such as JasperReports and Pentaho to generate reports with data from many sources. Multiple database querying - add UnityJDBC to your favorite query tool (e.g. 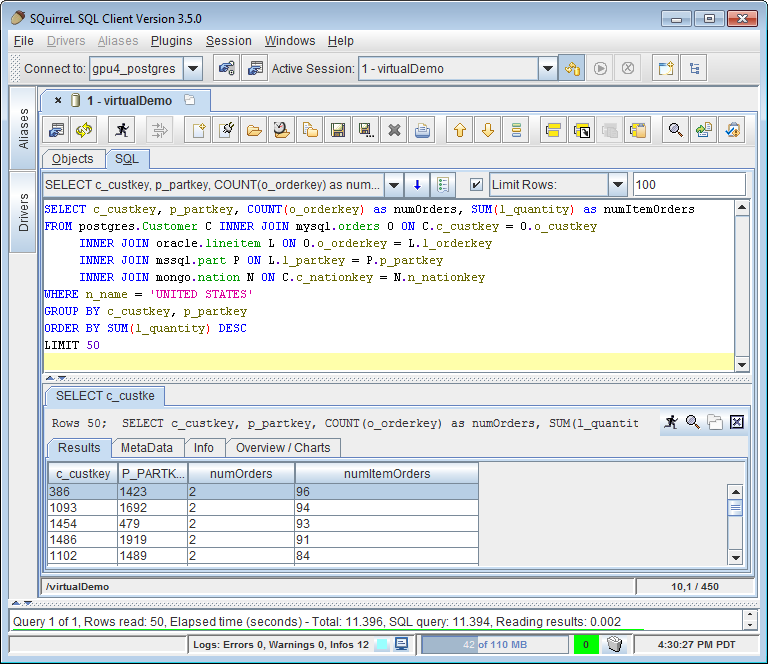 SQuirreL SQL, Rapid SQL®, Aqua Data Studio, DatabaseSpy, RazorSQL) and perform multiple database queries and joins. Build portable and maintainable applications - UnityJDBC provides function and SQL translation for database dialects. Develop your application with one SQL dialect, and UnityJDBC will translate it automatically for whatever database is used. Rapid Integration and Data Virtualization - Do you need an answer now? Write a query, generate a report, or build an application in minutes that combines data in real-time from multiple sources. No new software or system changes and no hassle. UnityJDBC data virtualization requires no ETL or data warehousing and provides results immediately. UnityJDBC technology is used in the GE Industrial Big Data initiative to integrate and analyze data from operational systems for business value. "Your driver is perfect for reporting across multiple data sources simultaneously. It suddenly became absolutely essential in a hundred different places."